Vinegar has an amazingly long shelf life, and is good for all kinds of things besides making salad dressing, or an ingredient to color Easter eggs- it has a huge variety of household uses. Check out this article from Readers Digest with 150 ways to use Vinegar! -Thanks for the e-mails and comments to Nick, Dani & Lacey! My store was very well stocked on these last night. We didn’t get the coupon in our local SS but I was able to get coupons through a service for a great price. Yay for not needing to buy vinegar for a LONG time! We didn’t get this coupon either. 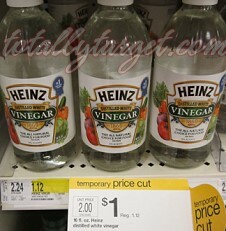 Vinegar is a main ingredient in a cleaning solution I make for our floors. Drats! I also did not get the coupon. We’re in NY. I’m on a pickling kick so this is perfect!! All out of apple cider vinegar so this is perfect. It’s great to keep fruit flies away from the fruit bowl!